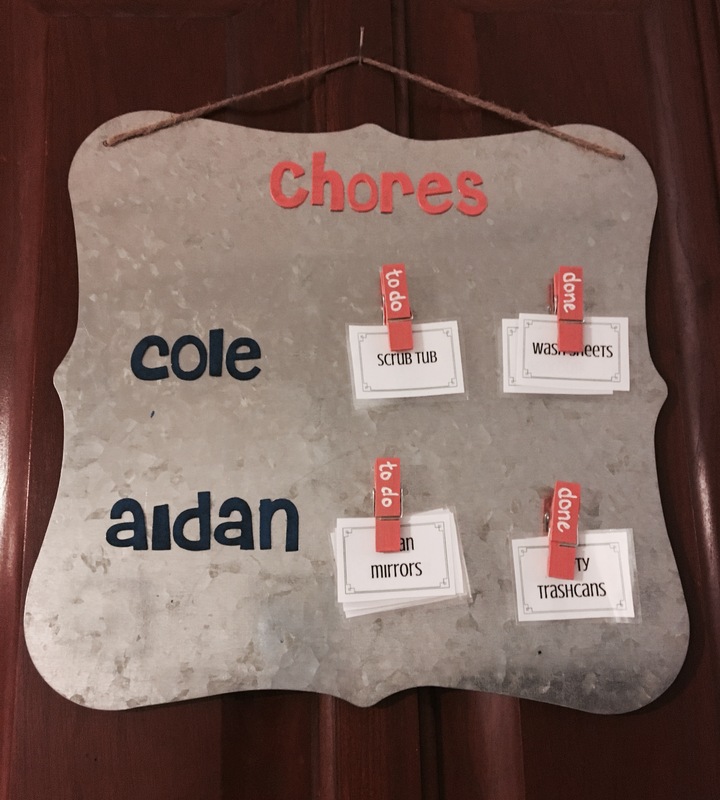 Continuing in my “New Year, New You” vein this week, I created a chore chart for my kiddos. Part of my journey into better time management includes delegation. My children are plenty old enough (way past old enough if the truth is told) to contribute with the running of the household. They are currently skating by with the very minimum amount of chores, BUT that is changing in 2017 because guess what? Mom isn’t the only one living in this house, so Mom isn’t the only one that is gonna clean it! 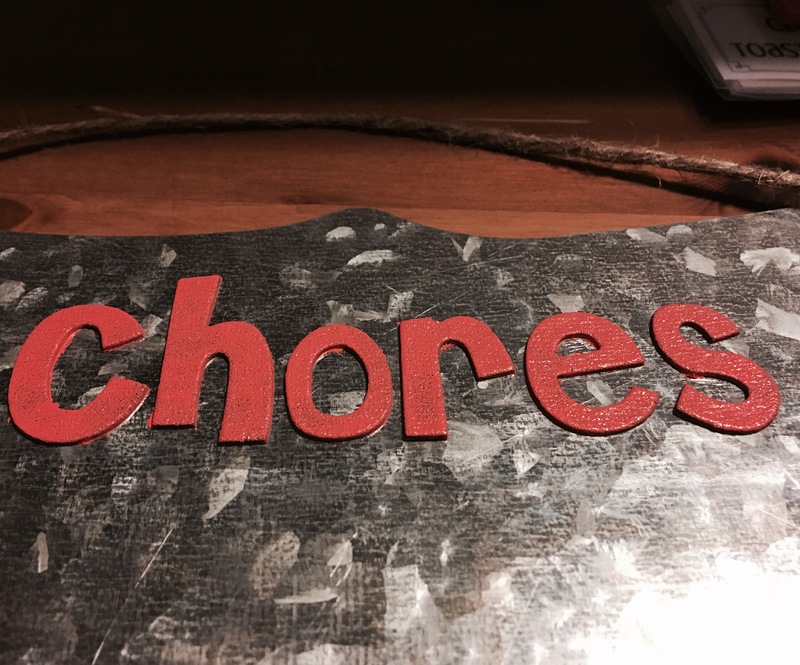 A few months ago, I read a post about assigning family members chore cards. KC’s site is a great resource for organization and planning. 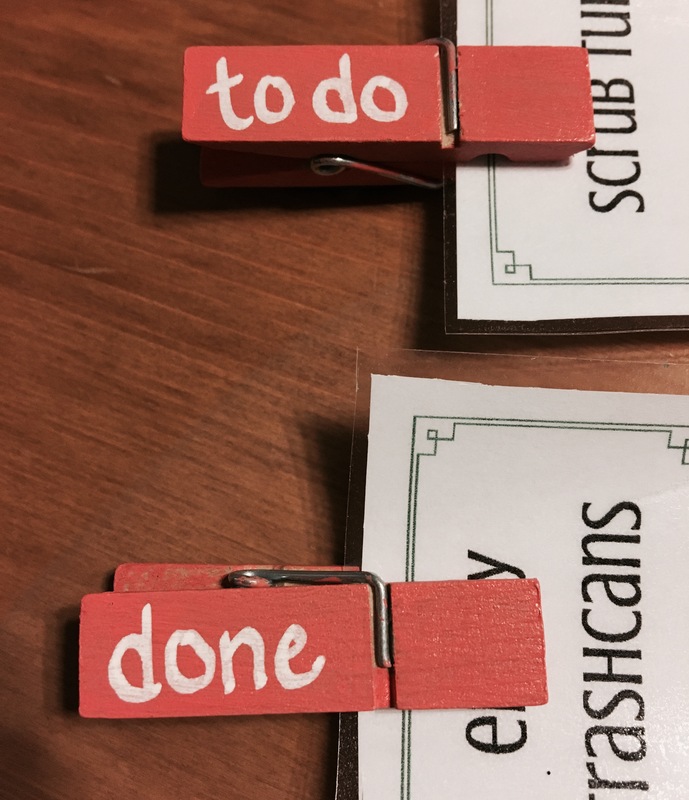 She has an awesome cleaning schedule and a lot of labels/tags available for download. I originally planned on using a wooden plaque, until I found this metal one that I loved. It changed up my initial idea a little, but I really love the way this turned out. Also, I originally planned on using stencils for the lettering because I wanted to use a coral and blue color scheme, but I was not shopping in my usual Michael’s and couldn’t find the stencils. I found these black glittery stickers on clearance instead. However, They didn’t paint very well at all. Next step was painting my mini clothespins. These guys were much better than the letters! Once dry, I glued little squares of magnets to one side. TIP: I stuck my magnet to the metal board while gluing that way I was sure to glue the non-magnetized side to the clothespin. 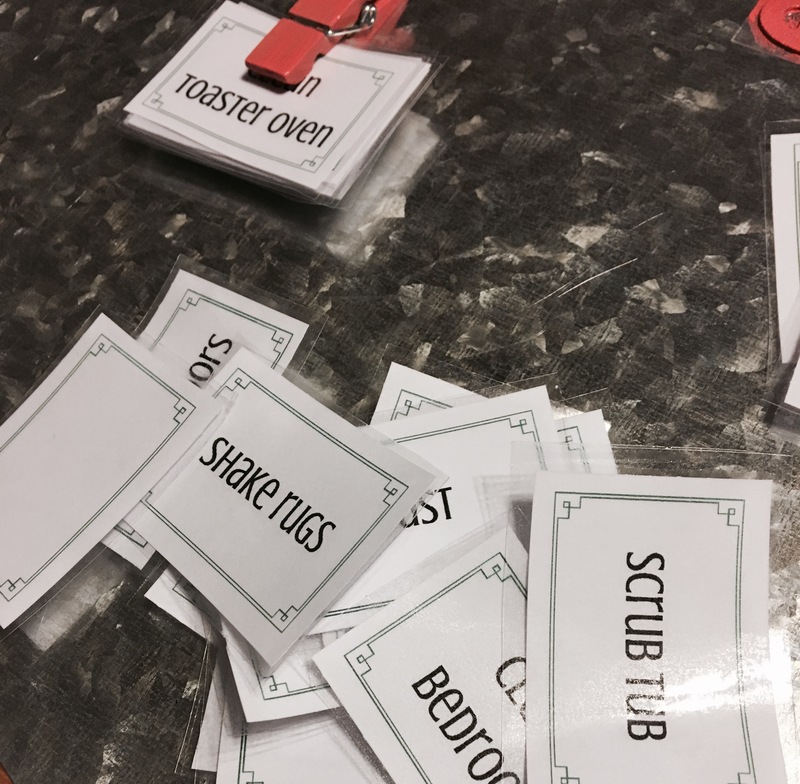 Now we are down to the chore cards! 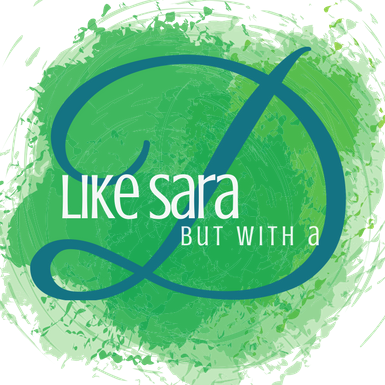 I made these guys in canva, and I am super stoked about how they came out. I included my sheets here for download. The first sheet is some of the random chores I will likely assign to the kids, and the second page is blank. I laminated several of the blank ones for writing in chores that may be seasonal or something the kids need to work on that is not the usual bit. 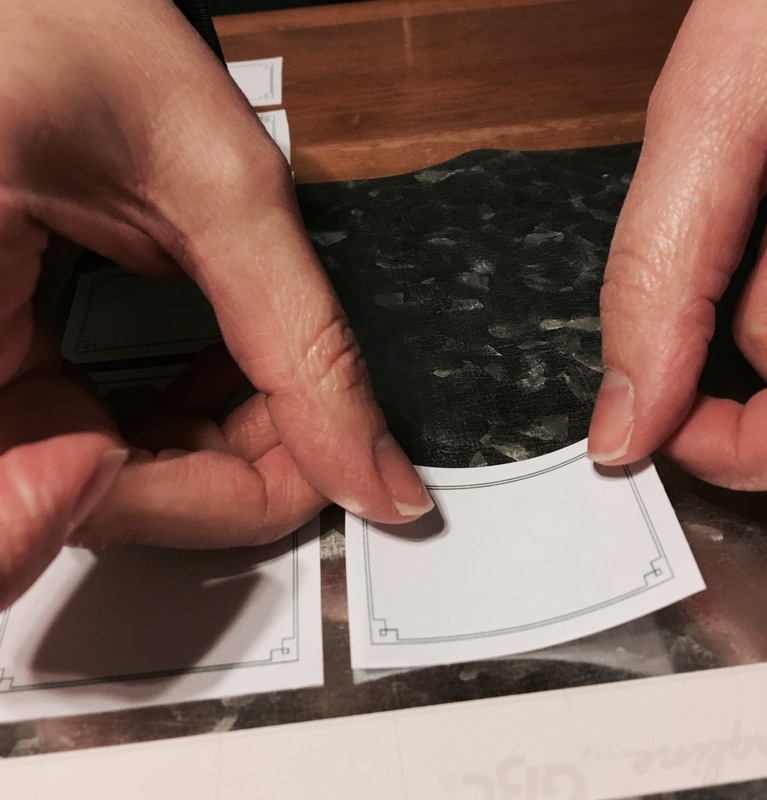 I was a tad hasty with laminating the first sheet so a few of my cards have bubbles. Boo. On the second sheet, I used more care, and they were perfecto. What chores do you assign your kids? How do you keep them on track? I love how easy this is. I could even get the kids involved in helping to make and decorate their own. We need to make one of these! Pinned. Glad you like it! I hope it gets your little ones motivated to help out.